← Beware which way the wind blows. There has been much media interest in a recent paper by Marcott et. 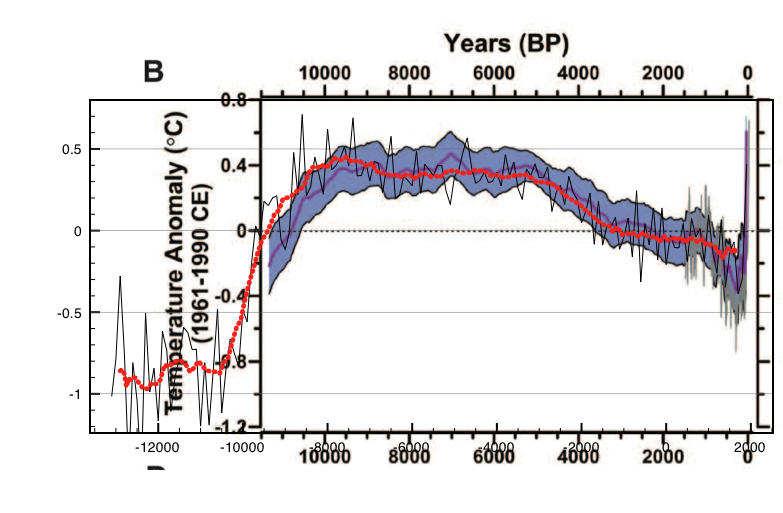 al “A Reconstruction of Regional and Global Temperature for the Past 11,300 Years” published in Science. It seemingly shows that following a slow cooling over the last 5000 years temperatures have rapidly risen to levels approaching the holocene maxima. The supplementary material for the paper provides details of the 73 temperature proxies used by Marcott. I decided to re-analysed from scratch these 73 temperature proxies to check the basic anaysis method because I was concerned about the 20 year interpolation and derivation of anomalies. This turned out to be problematic due to various Excel formatting problems and in modifying pre-esisting Hadley/CRU PERL software to deal with multi-annual resolution.The proxy data have been binned in 100 year slices from AD -13100 to AD 1990. Normals for each proxy were calculated using a baseline of 5800 and 6200 ybp. These were then used to calculate temperature “anomalies” defined as changes in temperature relative to this baseline. The geographic averages over all proxies in each bin were combined to determine the average global, NH and SH temperatures and anomalies. Finally a renormalisation of the anomalies from the original baseline to the CRU baseline of 1961-1990 was done simply by shifting up all the anomalies by +0.3 so as to align it with HADCRUT4. The value of 0.3 was derived from the graph. I am now confident now that the analysis as published has been done correctly. The results are shown in Fig 1. 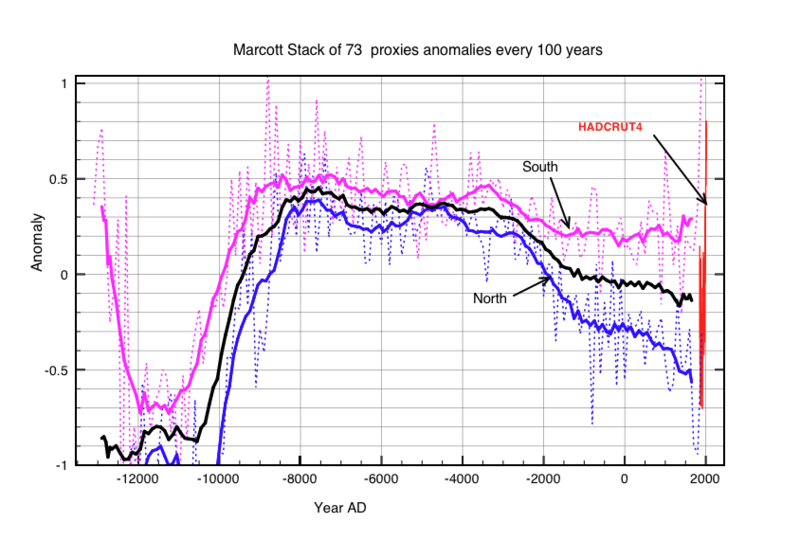 Marcott’s result (except the final uptick) is thus validated by this independent analysis. The cold period corresponding to the Younger Dryas period is apparent 12000 years ago. Steve Mcintyre has already shown that the large final upturn post 1950 in the proxy data is largely due to a shifting in the published dates. Since everyone already suspected that the real intention was to splice these results to the instrument day, I simply adapted exactly the same software algorithm as used to derive HADCRUT4 anomalies. It should be remembered however that the absolute scale remains dependent on the assumption that the proxies line up with the instrument anomalies. A common argument as to why temperature anomalies are used instead of absolute temperatures for the instrument data is the need to remove site dependent seasonal dependencies rather than location dependence. However for the proxy data anomalies are “needed” precisely because of geographical biases. We can see this directly by calcluating the temperature dependence of the data. Figure 2: Area averaged temperatures for the 73 proxies. 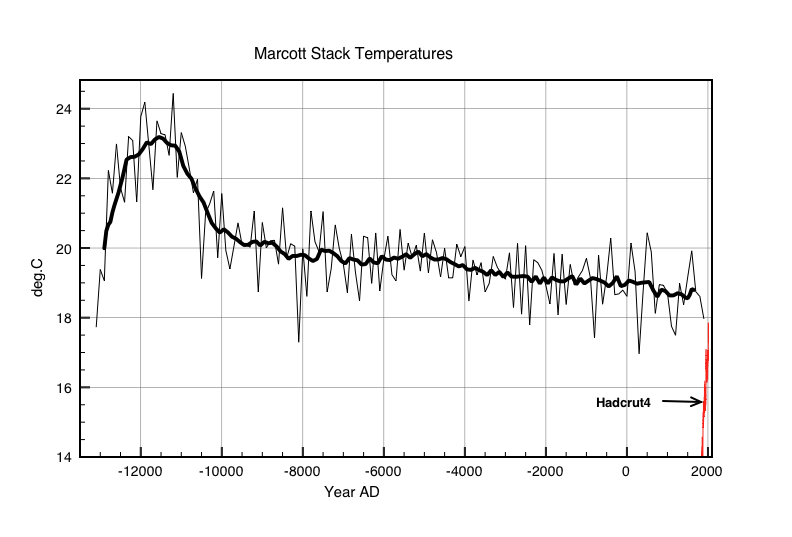 Temperatures actually increase while anomalies decrease in the Younger Dryas period -10000 to -12000. The older proxies tend to be located in low latitudes giving the effect of rising temperatures earlier. The time coverage of the proxies can be seen by comparing the the number of proxies contributing to each 100 year bin. 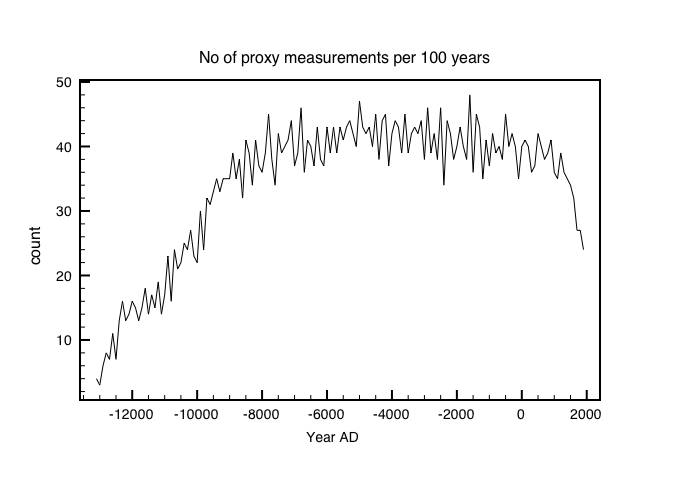 Fig 3: Number of proxy temperature measurements in each 100 year bin . The best coverage is between 1000 and 9000 YBP. Now we look at the variation in trends between the Southern Hemisphere and the Northern Hemisphere over the last 12,000 years. Figure 3 shows the 1961-1990 anomaly for the global, SH and NH components. There are clear differences in the trends. The only evidence of an uptick in temperature during the last 100 years originates from the Southern Hemisphere. Figure 3: Detailed differences between SH and NH proxy temperature anomalies. Global temperatures are not directly measured. Instead it is simply assumed that climate change is a global phenomenum resulting in a single linear shift in temperatures at all latitudes. This linear shift can be measured at each location by normalising to some average temperaure over a reference period. For the 73 proxies the reference period with most coverage is about 6000 years ago. This defines the zero line for their temperature anomalies. An assumption is then made that the more recent anomalies of the proxies measured into the 20th century simply line up with instrument derived proxies. This then results in a ~0.3C upward shift in the proxy anomalies, in agreement with the Marcott publication in Science. Only under these assumptions can we say that Holocene warmed to about 0.4 C higher than the late 20th century followed by a gradual cooling to the early 20th century. Updated 23/3: Proxy 62 contains 2 spurious zeros. That was the origin of the previous dip in anomalies 10,000 years ago – fixed now. This entry was posted in AGW, Climate Change, climate science, Ice Ages, Science and tagged Climate Change, global warming. Bookmark the permalink.